As we all know, what is considered fashionable and/or contemporary changes constantly in the realm of interior design and home furnishings. One such item that many are considering yesterday’s fashion can be found right above you for many of us – popcorn ceilings. Popcorn ceilings were initially instituted as a way to save money during the construction process. Instead of going through the lengthy process of floating, taping, and finishing drywall to the extent required of flat, smooth ceilings, drywall contractors could get the ceilings reasonably presentable and then use popcorn to cover up minor imperfections. As time went on, it actually became fashionable and mainly standard in new home construction. While many people find popcorn ceilings aesthetically pleasing, the building product certainly has its drawbacks. First, if you ever have a leak of any sort, the popcorn can lose its adhesive qualities as the water reactivates the drywall compound. Secondly, when you decide to repaint popcorn ceilings, the water in latex paint products will often reactivate the popcorn in a similar fashion to a roof leak. Finally, once damaged, popcorn ceilings are often difficult (though certainly not impossible) to repair seamlessly. The variations in application, size of aggregate, the machinery used, and the operator can make a patch job look significantly different than the popcorn that was initially installed. And while you may feather an area in, usually there is some slight overlap around the perimeter that is denser than either the existing or new popcorn. If you are going to remove your popcorn ceiling, the first thing you’ll want to know is if it has been previously painted. If the answer to this is no, you’re in luck. If you’re popcorn ceiling has been painted, it will be significantly more difficult to remove. A coating of paint over popcorn, in many instances, prevents water from being able to loosen and reactive the drywall compound that causes popcorn to adhere to the surface of the drywall paneling in ceilings. 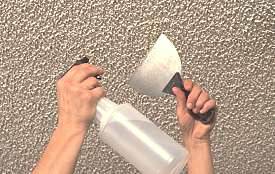 Additionally, the extra scraping effort required to remove painted popcorn coupled with the fact that water is often ineffective in loosening the material usually means that more work will be needed to repair the drywall from the effects of removing the popcorn. If your popcorn ceiling is unpainted, begin by first covering the area with plastic and/or dropcloths and draping plastic around the walls of the work area. Be sure to use painter’s tape so as not to damage any finished walls or trim below the popcorn ceilings. Once the area is covered, begin spraying warm water over the popcorn ceiling and let it soak in. The longer you can let the popcorn soak the better. Once the popcorn is thoroughly damp, take a typical 5-in-1 or putty knife and begin to scrape off the popcorn. Remember to be gentle with the removal because what you damage in this step you will have to repair in the next step. Once you have removed the popcorn, begin sanding the damaged, uneven areas. You may need to re-tape and re-mud areas. On flat surfaces you will likely need to use a variety of large and small mud knives – remember that putting on multiple thin coats is the approach you want to take. Sometimes, depending on the extent of the damage, and if water damage is present, you may need to prime areas prior to performing mud work. If there is indeed water damage, you will need to use an oil based interior primer designed for stain blocking. Once you have floated out the damaged areas and caulked the ceiling in areas adjacent to the trim if present, you are ready to apply two coats of ceiling paint to the areas. Now, just bag and clean up the mess and you have sleek, contemporary flat ceilings! If you decide that all this is simply altogether too much for you, or if you lack the technical capabilities to perform the project, feel free to call Painter Ready at 423-648-4408 or schedule a FREE estimate on our website by clicking here..
We service the Greater Hamilton County areas including Chattanooga, Hixson, Soddy Daisy, Lookout Mountain, Signal Mountain, and Cleveland, TN. We also cover Northwest Georgia including Ringgold, Chickamauga, Rossville, Dalton and Rock Springs, GA. And, we always travel as needed to service our commercial painting clients.